ShukerNature: MYSTERY CATS IN SHOWBUSINESS - YOUR ASSISTANCE IS REQUESTED! MYSTERY CATS IN SHOWBUSINESS - YOUR ASSISTANCE IS REQUESTED! The entertainment world may not be the most likely realm in which to encounter real-life mystery cats, but a number of intriguing examples have cropped up here from time to time, including the following two cases - neither of which has been resolved so far. A BLACK TIGER IN THE CIRCUS? Melanistic (all-black) specimens of leopards Panthera pardus (commonly termed black panthers) and jaguars P. onca are well known. Conversely, although there have been many reports of all-black tigers P. tigris (see my book Mystery Cats of the World, 1989, for the first - and still the most detailed - review of cases ever published), not a single specimen or skin of one has ever been formally submitted for scientific examination and verification. "I remember once seeing a large book about the history of the Ringling Brothers Circus and was surprised to find a clear photo of a big cat trainer with a "Black" tiger (you could still make out his stripes though) mixed in with his normal Bengals. Is this for real?" If only I knew! 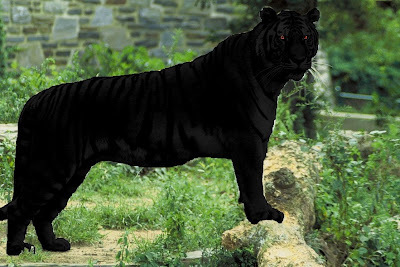 However, the fact that its stripes could still be discerned against its fur's black background colouration is precisely what one would expect with a genuine melanistic tiger, just as the rosettes of black leopards and jaguars can be perceived against their fur's ebony ground colour when viewed closely or at certain angles. "Sorry for the uncertainty of my memory concerning the black tiger photo but the best I can remember [is] it was a coffee table sized, hardcover book. My best recollection is that the title was "The History of Ringling Bros. and Barnum & Bailey Circus". I'm sure it would have been around 1974 or 1975 when I saw the book, new, in a bookstore at our local mall. The photo was in towards the middle of the book. It pictured a trainer in a cage with 4 or 5 bengals, one appearing to be black. "I hope this isn't another case like the "Thunderbird Photo", but I can assure you, as a young kid of about 10 or 11 at the time, I was thoroughly fascinated with big cats and would go to the mall every Saturday for as long as that book store was in business and I would look at that photo. I don't know why it never crossed my mind to ask my mom to buy it for me. I do know that for that age I could distinguish big cat subtleties (like the still visible spots on a black leopard) and was amazed by this photo because it appeared to show stripes under the dark fur." The late Mark Chorvinsky, Strange Magazine's founding editor and a longstanding friend of mine, had a lifelong interest and extensive knowledge of circus history, so I swiftly informed him of Bill's remarkable news, and Mark promptly contacted the Ringling Brothers Circus requesting any information that they could send concerning this melanistic mystery. Sadly, however, he never received any reply, but Bill and I have continued to collaborate fully in pursuing this compelling mystery in the hope of uncovering not only the photo but, as a result, proof that a living black tiger was actually maintained in captivity! Another cryptozoological researcher who greatly assisted us was the late Scott T. Norman, from California. After receiving details from Bill, Scott conducted some extensive Internet searches and sent out many requests for information relating to this photo. Again, however, no further details were forthcoming. Has anyone reading this ShukerNature blog post seen the book and the all-important photograph inside it referred to by Bill? Or does anyone have any additional information concerning the possible presence of a black tiger in the Ringling Brothers Circus? If so, I'd greatly welcome any details that you could send to me or post here. Remarkably, the above feline enigma is not the only mystery cat from the realms of showbusiness whose apparent existence has been brought to my attention by Bill Rebsamen. Bill also very kindly alerted me to the curious black-headed leopard that appeared in an episode of the 'Tarzan' television series from the 1960s, starring Ron Ely in the title role. According to Bill, in the storyline of this particular episode Tarzan's sidekick was a 12-year-old boy from India who had made friends with a spotted leopard that was black from the neck up, and which was being pursued by evil fortune-hunting poachers. 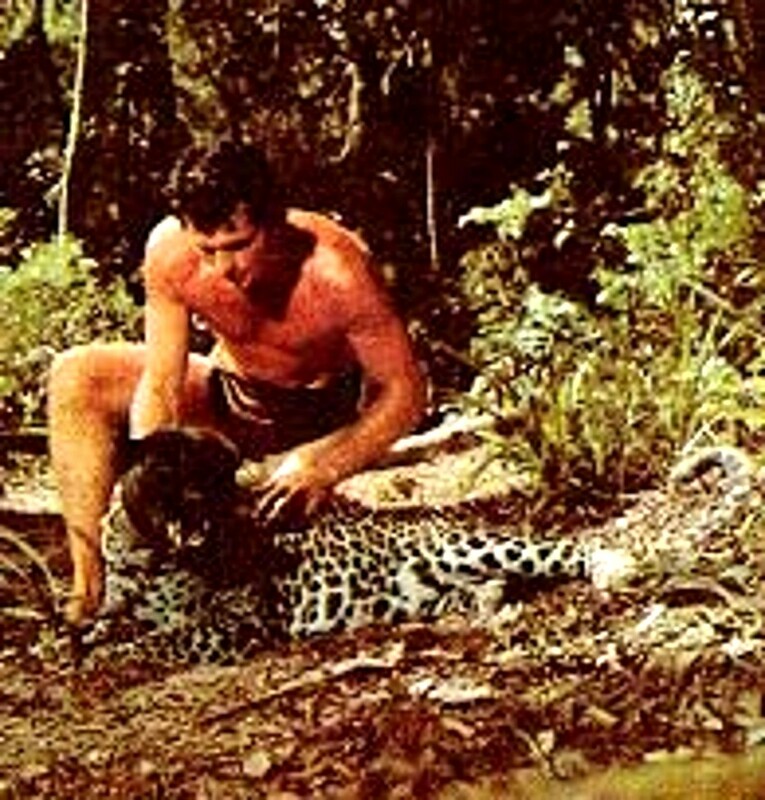 After a number of e-mails and Internet requests, Bill succeeded in obtaining a copy of a frame from the episode, shown above at the beginning of this ShukerNature post, depicting a black-headed leopard lying next to Ron Ely. "It seems to me this [the black-headed leopard] may fall under the "stranger than fiction category" when you ask the question as to why would someone go through the trouble of dyeing the leopard's head black for a syndicated TV show watched by people who would, for the most part, not realize the significance of this rarity?" If its rarity is not specifically alluded to in the programme, then Bill does have a point. Also, it has to be conceded that transforming a leopard in this way would prevent any stock footage of leopards being used in that particular show (which is a common - and financially sensible! - practice when putting together a show containing a lot of animal footage). Despite continued efforts, Bill did not succeed in his attempts to track down the show's producer, animal trainer, or anyone else with knowledge of this episode, in order to uncover the true identity and history of its melanocephalic animal star. So once again, if anyone reading this ShukerNature post has any relevant information, I'd love to hear from you - it may not be too late even now to solve yet another feline mystery emanating unexpectedly from the entertainment world. 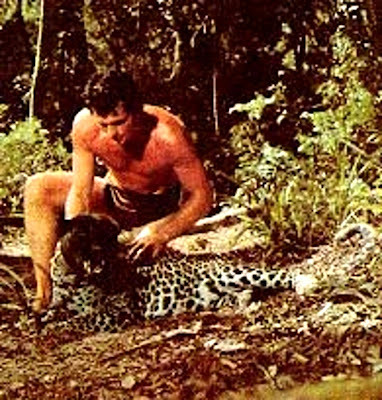 Yesterday, I learnt from American correspondent Shane Lea that he owned the full set of the 'Tarzan' episodes starring Ron Ely, and he promised to go through them in search of the elusive and enigmatic black-headed leopard. I mentioned that one episode was entitled 'Leopard on the Loose' - perhaps it featured in that one. All I need to do now is find a DVD of this episode that is compatible for viewing using a British DVD player - sadly, American DVDs are not compatible. So watch this space for further developments! 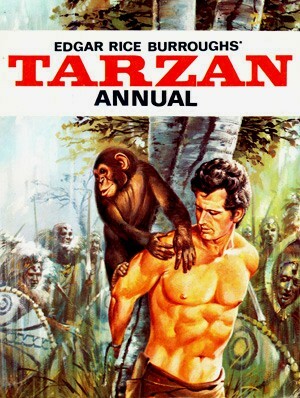 Why not try to contact Ron Ely, who played the "Tarzan" part in the referred film. I understand from articles on the internet, that he´s still alive and well, making a living as a novelist. He may know something of interest. What was the name of the Tarzan episode? I might be able to find it on Wikipedia or do a Google search. If so, I could find the ruth about this jaguar. or was it a leopard? can't remember. As for the black tiger, I should be able to do a search for the book and maybe find the picture. If I'm really lucky, it could be available as an e-book. Doubtful, though. Thanks for your help! Unfortunately, however, I don't know in which episode it appeared, though there was one entitled 'Leopard on the Loose'. Which part-black jaguar are you referring to? Thanks very much for the suggestion, Palle. I've now been added as a Friend by Ron on his Facebook page and I posted a request on his FB Wall for info re the black-headed leopard. So perhaps he'll send me a response concerning it. Sorry, I forgot if it was a jaguar or a leopard! Sorry for the confusion. 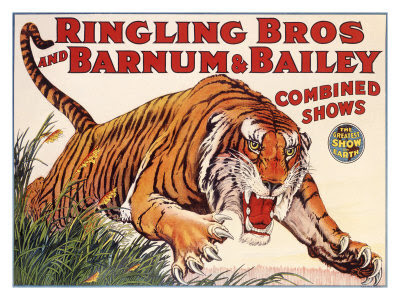 As for the tiger, is it possible that the book could have been called "Ringling Brothers and Barnum and Bailey Circus: The Greatest Show on Earth" instead? I found a book with this title which might provide the answer if the title was misprinted or something. Hope it helps. Also, a Wikipedia article mentioned that a tiger trainer fought a dozen tigers and a black panther. Could the panther refer to a black tiger? Wasn't able to find any info on the black headed leopard, and personally I believe it is, like the krow and the piltdown man, nonexistent, created with body paint and an unwilling leopard. I do have hope for the black tiger, though I couldn't find any references to the book online. Maybe a misspelling? In any sense, I hope that the results I have found so far prove satisfactory. I am very proud to be working to find information for the legendary Dr. Karl Shuker! I have The Lost Ark. There are two things that I know of immediately that may help somewhat. In regards to the black-headed leopard, there is a "black-faced puma," known as Thomas, at the Wild Animal Sanctuary in Colorado. There is no photos of the specimen on their website, but you might be able to contact the owners and obtain one to compare it. I'm not sure if it's just a typical puma with black cheeks, or if the majority of the head is indeed melanistic. The black tiger in the Ringling Circus is a puzzle. Mabel Stark had an act with several tigers and a black jaguar. The black jaguar was large, and in photos one might mistake it for a black tiger. In posters during that period of her act, there is no mention to the animal being a black jaguar, just references to Mabel Stark, Tiger Trainer. So a simple mistake is possible. However, I have also seen the photograph in an old circus book, but I'm not sure the book was just about Ringling Bros. I do remember seeing the black stripes on a black background and wondering if it was shadow or poor photography, as the photograph itself was in black and white. The book was from University of Wyoming library, I believe, but this would have been around 1993 or so and I haven't seen the book since. The photo was definitely a very dark tiger; the underside was not white, it was also dark. The beast had the typical neck-ruff a tiger has, but again, as to whether the tiger was melanistic, or it was shadow, I could not tell. Hope this helps, I'll add to the hunt of those looking again for this book. Thank you so much for your very welcome and valuable input. The black-faced puma is new to me, so I'll definitely check this out, and I'm very grateful for your own personal recollections concerning the black tiger photo in the circus book. I'm writing this subject up for my forthcoming book on mysterious cats, so I'd very much like to add to my coverage your recollections, credited fully to you, if you have no objection to my doing this, because they may well assist in locating the book, either directly or via someone else reading them and recalling their own sighting of or details re the book. Dr. Shuker, I just sent 3 emails to your aol address, with several more links to photos, actual film, and books of albinism and melanism in leopards, tigers, and pumas. Some of this info is as old as 1931 and might be new to you, so make sure to read the emails and not click as spam! What an interesting article ! I made some research about black tigers. These bengal tigers (visibly 2 different tigers after a comparison of stripes) seem to be very dark. On the second photo, the tiger jumping on the man is clearly darker than the one in the background. On the first photo, the contrast between the white part of the body and the back is amazing. Some tigers are very dark, in a black and white photo it's impossible to see if the animal is blackish or dark brown. But according with others melanistic cats, it should not have any white on the fur, like on the belly. About the black-headed leopard, I read an article on Messybeast about a tiger, painted in black for a film, he died some months after because of the chemical dye. I think this mutation must be possible in nature. Maybe a case of mosaicism can produce this phenotype ? I just found photos and vidéos from the film "The Beastmaster" on Google, there is a black tiger, a dye was used to color the skin. "The black tiger of the film Beastmaster. I have corresponded with author Andre Norton for nearly seventeen years, and in that period the subject of Beastmaster came up once or twice. Beastmaster had nothing to do with Ms. Norton's sf novel of the same name beyond the title, but this was not the only reason she disavowed the movie. According to her, the tiger that portrayed the black feline died from either licking or from simply absorbing through the skin the dye used to darken its fur. 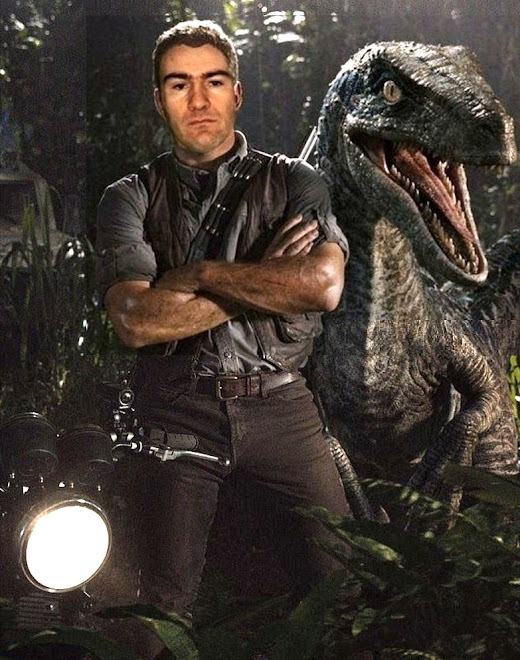 This may be the reason Gentle Jungle has been reluctant to reply to Dr. Shuker's queries. Hi. Someone in my family that has said that they worked for the circus in the 50s has told the family story about the tigers they used to do things to for the show. One of the things was rub their fur with something called "grease". He said that sometimes if a tiger would get too close to the fire, or if only one tiger would jump through the flames during a performance that heat and soot would turn their fur a weird black that they'd have to spend an hour or more washing and sometimes, for multiple performances, it would be allowed to build up over days creating black tigers that b&b circus quietly advertised in news and book photos. According to him, there were no black tigers, but that circus officials allowed people to think so because a black tiger sold more tickets. Other colors of tigers have been reported. There have been reports of a black tiger but none of these are authenticated except perhaps a Chittagong dead specimen back in 1846. Blue or slate-colored tigers have been heard of but not really confirmed. These tigers are called Maltese tigers. Another unconfirmed tiger color is predominantly black. If such a tiger exists, it may be a mutation instead of a separate, distinct species. There you can find sightings of black tigers since 1772 to the current days. I hope this information can help you in your search for the black tigers. Thanks for the links, which I greatly appreciated. As it happens, however, most of the information on them has been derived from my book Mystery Cats of the World (1989). Most of the information on the internet dealing with tropical mystery cats and unusual coat colouration in wild cats has been obtained from my book, lol, so I'm already well-acquainted with it. But thanks again for kindly pointing the links out to me. I love the website I just found it and today and I have been reading the various articles for hours on end. Thanks for all the hard work you have put in for us! Having always been an avid fan of the Tarzan movies and television series, and wondering about the animal actors and their welfare, I thought this information might be of value to you, possibly availing your search for further leads. Louis Goebel, the animal trainer whose Jungleland lion compound in California was a popular attraction from 1925 to 1969, died at his home on April 24, 1981. He was 84 years old. Among the animals at Jungleland were Metro-Goldwyn-Mayer's mascot, Leo the Lion. Mr. Goebel was the son of a New York butcher. He worked at Universal Studios in the early 1920's, cleaning up after animal stars. When Universal disbanded its studio zoo, he bought a parcel of land and five of Universal's lions to start Goebel's Lion Farm. Jungle pictures were popular at the time, and the Lion Farm soon included all kinds of exotic beasts, prompting the name change to Jungleland.